It is tough to find a genuine reader who love detective fictions and crime thrillers who is not familiar with Sherlock Holmes. This fictional creation of Sir Arthur Conan Doyle got so much fame that at one point, the author himself started feeling overshadowed by his creation!! Yes, he thus decided to put it to an end. And, there came a Sherlock Holmes story, where Sherlock meet with his death! The reactions by readers were so aggressive that later the author have to bring Sherlock back by being declared as surviving from the death! The detective fictions portraying Sherlock Holmes have created so much trends which were followed by almost all detective fiction writers. For example the idea of being a great observer, having a sidekick (named Dr. John Watson), and more… There is Ajit Banerji for Byomkesh Bakshi, Feluda have Tapesh, Poirot have Hastings and so on. Agatha Christie herself was influenced by Sherlock Holmes stories. Most of work by Arthur Conan Doyle featuring Sherlock Holmes is available for free at Project Gutenberg. These detective stories have always fascinated the makers to make Films, Plays, TV series and other stuff based on them. Some makes went to an extent to add something to the story from imagination, for example a movie named Young Sherlock Holmes was made with imagination of young Sherlock Holmes, how he could have met Watson and his raw with Moriarty, his possible girl friend, and much more. Without A Clue was also such kind of movie, where we see the roles and abilities of Sherlock and Watson are interchanged, it was also a nice imagination by the makers. 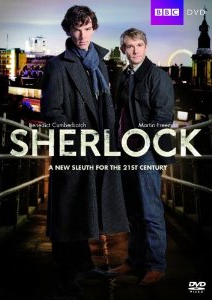 Recently we found the TV Series Sherlock which was originally aired on BBC is available as a set of DVDs. Actually all the three seasons are available as a set of DVD separately. The first season contains 2 DVDs. These 2 DVDs are having all 3 episodes of first season in HD quality. In addition you can find commentaries and other interesting material to go for. 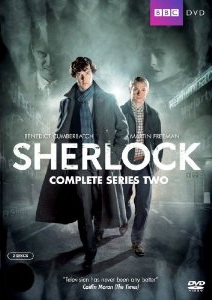 The second season contains 2 DVDs. These 2 DVDs are having all 3 episodes of in HD quality. In addition you can find commentaries and other interesting material to go for. The third season contains 2 DVDs. These 2 DVDs are having all 3 episodes of in HD quality. In addition you can find commentaries and other interesting material to go for. This serial modernize the stores and it consolidates several stories in a long story. You can see Sherlock using mobile phone, laptop and other gadgets in this serial. More techno savvy Villains and Dr. John Watson as an army doctor who returned from war at Gulf, who runs his own blog, and other such twists make the stories more interesting. The serial is a marvel in terms of technology. We will be reviewing each episode individually so you can know more about various aspects of the same.